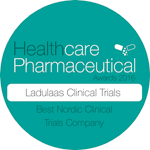 Ladulaas Clinical Trials is a specialized and competent unit for clinical trials. 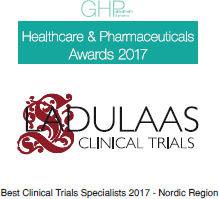 We're educated and trained in ICH-GCP and long experienced in conducting clinical trials in different phases and extensions. We work together with most of the major pharmaceutical- and CRO companies and we also cooperate with medical faculties all over the world. We know the importance of well treatment and security to make the participants fulfill the whole protocol. So far we have participated in more than 80 trials concerning Asthma, Diabetes, Hypertension, Obesity, Lipidemia, Vaccines, Incontinence, Anticoagulation, Migraine, Prevention of Cardiac Infarction, COPD, Pain etc... From Phase II to IV. We are ongoing both audited and inspected with good results. We also perform Clinical Trials concerning Medical Devices and Functional Food. In recent years we have been proud receivers of several awards for our work. 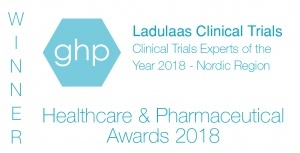 This year, we received "Clinical Trials Experts of the Year 2018 - Nordic Region" from the British scientific paper Global Health and Pharma . We are easy to reach, situated in the center of Borås, with 110 000 inhabitants. Within a radius of 80 km, more than 1 million inhabitants can be reached. It takes 20 minutes by car to Landvetter Airport (GOT). 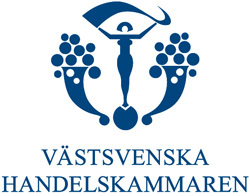 Mail your proposals to info@ladulaaskliniken.se and we will answer your feasibility in a promtly manner.